284 pages | 44 B/W Illus. In an era of rapid and extensive globalisation, the world faces a wide range of transboundary problems that require effective collective action. Key among these are threats to human health that do not recognise national borders, and include emerging and re-emerging infections, rising rates of chronic diseases, inadequate access to affordable and safe medicines, spreading anti-microbial resistance and the health effects of climate change. These threats require a transnational response and thus pose significant challenges to global health governance, as well as to long established notions of national sovereignty. This book investigates the neglected question of the impact of a rising Asia on the management of transboundary health problems. 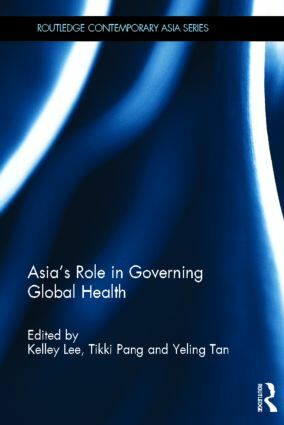 The chapters examine the role played by Asia in the governance of a range of global health issues, from development assistance in health, to global health instruments dealing with tobacco control and disease outbreaks, to health research and knowledge products, and the book concludes by examining the broad themes of a rising Asia’s role in the complexity of global health governance. The various analyses are tied together by a common focus on Asian countries’ use of the sovereignty principle, and seek to understand how traditional notions of national sovereignty can both clash with, and enhance, governance objectives in global health. In addition, the contributors examine the interaction between global, regional and domestic institutions, and present current ideas in Asia on the challenge of governing global health. With an inter-disciplinary approach that combines international relations, public policy and public health, this book will be invaluable to both scholars and policy makers working in these fields, as well as Asian politics, social policy and governance more generally. "Asia is rising. The West is not. Similarly, Asian health standards and practices are improving significantly: from the discovery of a new virus in Malaysia to a cost-innovative approach to head surgery in India or to an innovative universal health insurance scheme in Thailand. In short, the world can learn a lot from Asia in the area. And it can also pay more attention to Asian ideas for improving global health governance. This is why this book is both timely and valuable: it provides new and unique insights into new thinking and developments in Asia. Both academics and practitioners will profit a lot by studying this volume in depth." "The first of its kind, this informative and insightful volume assembles some of the world’s leading global health scholars to examine Asian countries’ participation in global health governance. It not only addresses some critical issues of global health governance, but also explores the "distinctiveness" of Asia’s conceptions of and contributions to global health governance. It should be of strong interest to students, scholars, practitioners, even laypeople who are keen to learn more about the rise of Asia and its global governance implications." "With its stellar list of authors from around the world, this book should be required reading for anyone who wants to be sure that global health is not left behind in the changing world order"
"This publication is a stellar example of the convergence of technical deliberations and research outputs as policy relevant-normative input—beyond that it is also an important contribution in global health from a region that is fast emerging as an epicenter." "Global geopolitics and health are undergoing unprecedented transitions. How is Asia's growing influence linked to the governance of global health? This book reveals surprising and compelling answers." "The distinguished editors, all with close connections to Asia, have put together a significant contribution to the field of global health politics. The book covers a major gap in the academic literature, Asian countries approach to global health governance. It is essential reading for all those working at the interface of global health and international relations." "Health is occupying an increasingly central role in the global agenda, and Asia has become one of the leading regions in the world. The message of the book edited by Lee, Pang and Tan is that the overlap of these two processes is one of the key developments of our times. This book addresses with clarity, vision and ambition a topic of enormous relevance for everyone working at the intersection of health and globalization." Kelley Lee is Head, Politics and Policy Group, Department of Global Health and Development, London School of Hygiene & Tropical Medicine, United Kingdom. Tikki Pang is Director, Research Policy & Cooperation, World Health Organization, Switzerland. Yeling Tan is a PhD candidate at the John F Kennedy School of Government, Harvard University, USA.